And movies: Wow. Here I thought I was simply at the mercy of the dreary post-processing Hollywood uses to lend a false sense of gravity to drama. Well, maybe, but certainly not to the extent I’d thought. Who knew the superhero suits in The Incredibles were actually scarlet? Minions aren’t just solid bright yellow? Get outta’ here! If you want to get technical: The 276E delivers 99 percent of the Adobe RGB spectrum, and 100 percent of the older sRGB color space. That sounds awesome, but those are both actually older standards: Adobe RGB encompasses the world of print, while sRGB is the older HD/FHD (720/1080p) Rec.709 color standard. Neither color space is as broad as the newer Rec.2020 standard for UHD/4K displays; however, both are significantly larger than what the average LCD delivers. The fact that just these standards look so vivid compared to the average LCD says a lot about what’s been missing. There are also user settings for the amount of red, green, and blue. I had to lower the red from 100 to about 90 to make gray, well, gray, and reduce the blue to the 80’s to make red less pinkish. Also, if you can believe this, I found the 276E too bright in my home environment, even though it measured out at a maximum of 379 nits. I literally had to drop it to 20 percent before I was comfortable with it. On the other hand, it was nigh-on perfect for our fluorescent-heavy test center. The 276E sports VGA, DVI, and HDMI inputs. At only 1920x1080 (can you tell I’ve been testing UHD recently?) there’s no real need for DisplayPort input, though it would be nice. 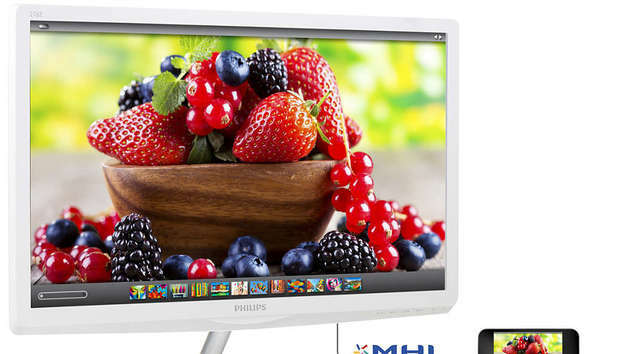 The HDMI supports MHL, so you can mirror your mobile device’s display. And though it’s not 2160p, it’s HDMI 2.0 and supports HDCP 2.2, so you can at least see upcoming copy-protected UHD content, if at half-resolution. There’s also a stereo mini-jack audio input if you don’t have other speakers.